Users who like Patrik De Haes, MD is CEO of Oxurion (Oxurion.com). Their first major success was cardiac drug tPA; today, Jetrea is their first commercialized product for diabetic eye disease, with three new molecules for diabetic eye disease in development. Users who reposted Patrik De Haes, MD is CEO of Oxurion (Oxurion.com). Their first major success was cardiac drug tPA; today, Jetrea is their first commercialized product for diabetic eye disease, with three new molecules for diabetic eye disease in development. Playlists containing Patrik De Haes, MD is CEO of Oxurion (Oxurion.com). Their first major success was cardiac drug tPA; today, Jetrea is their first commercialized product for diabetic eye disease, with three new molecules for diabetic eye disease in development. More tracks like Patrik De Haes, MD is CEO of Oxurion (Oxurion.com). 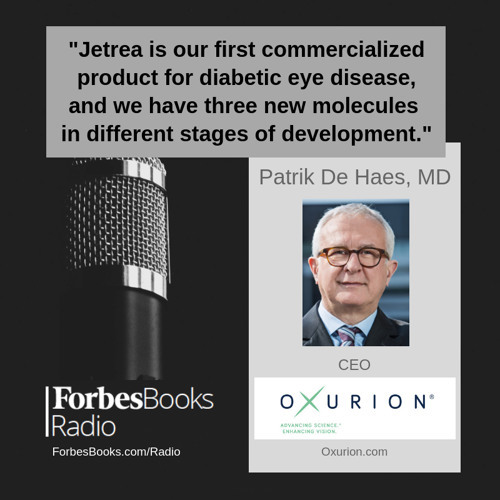 Their first major success was cardiac drug tPA; today, Jetrea is their first commercialized product for diabetic eye disease, with three new molecules for diabetic eye disease in development.